In the spring of 2002, when perusing garage sales in Waterloo, Ontario, I found a bag of fabric pieces labelled “Bear Paw $5.00″. While I examined it, I silently pondered the wisdom of taking on someone else’s unfinished projects. Good sense prevailed and I started to put the bag back down. However, intuiting my reluctance, the astute seller offered it to me for $2.00. My quilt-rescue hormones kicked in and before I had time to talk myself out of it, I bought it. Back at home, when I emptied the bag, I found the neatly stacked pieces for 18 bear paw blocks and two more blocks partially sewn. One look at the back of the completed units told me why the quilter abandoned the project. The piecer must have been a very new quilter, unaware of the standard scant 1/4 inch seam. She had sewn the blocks with a 3/8″ seam, so of course, nothing fit together as the pattern would have indicated. The quilter was likely overwhelmed and gave up. Frogging tools to the rescue! I picked the blocks apart and began to sew with the correct seam allowance. Even then, the half square triangles that form the claws were not precisely cut, so it was a challenge to get them to fit the blocks. I persisted in the fussy sewing and finally had 20 completed blocks. Because the finished blocks were not all precisely the same size, I opted to add coping strips in a yellow print and then square the blocks to an identical size. The brown print sashing included in the bag was set aside for other purposes while I raided my stash for a deep purple sashing. I made several sample sashing blocks to audition and my daughter, who has great color and design sense, immediately selected this green and gold diamond in the square block. She was right! They looked the best. 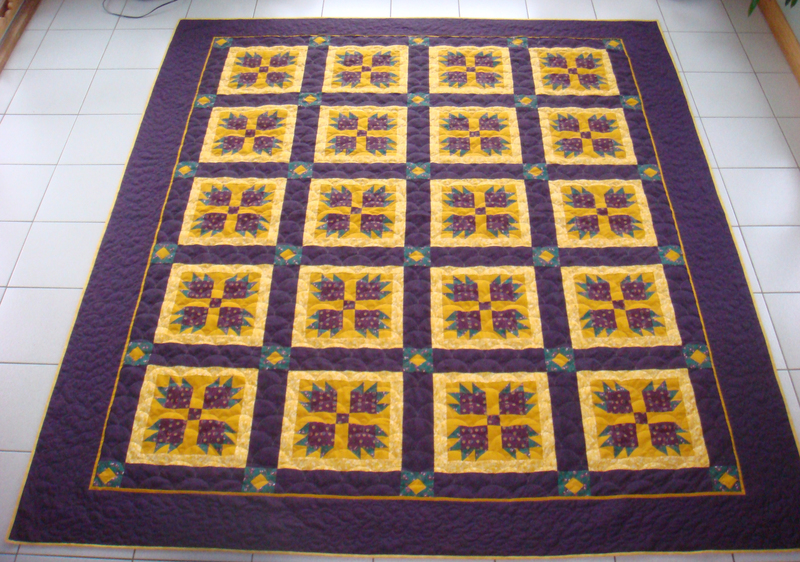 Once the quilt center was completed, I opted to add a gold flange and another wide dark purple border. The top was completed in February 2005 and lived in my flimsie cupboard ever since. I took it out to ponder a few times, but since I was not sure how to quilt it, it always went back into the cupboard. Now with the self-imposed pressure to get UFOs done, I finally loaded it on the longarm and began to quilt. When blocks that are not completely accurate, stitch in the ditch quilting brings attention to the flaws. I opted to do a Circle Lord Clamshell design from flange to flange. For this I used a tan colored cotton-covered poly thread with tan Bottom Line in the bobbin. In the wide outer border, I did a freehand feather with trailing tendrils using a dark red-violet thread to add definition. Once off the long arm, my domestic machine was used to topstitch the seam of the flange, to give it a bit of help to lie flat. I purposely did not stitch in the ditch, but rather aimed for a thread away from the seam line. The stitching is visible and adds a finishing element to the flange. For the binding, I pulled a coordinating mottled gold/yellow print from my stash. I am very pleased with the resulting quilt. I still love to rescue quilts and give them loving homes, but I am much more cognizant of the fact that I could make a quilt from scratch with much less effort! One of the advantages of working on someone else’s project is that you work with color combinations you would not normally choose. It expands one’s design horizons and allows freedom to try new things. There is less pressure when finishing an already flawed project. Perfectionism never comes into the picture! All in all, I am very pleased with the result of this project and I am delighted that my own design addition – the deep purple sashing and borders – makes a significant impact on the finished quilt, making those Bear Paw blocks really pop. I like this quilt very much! Finished size is 88″ by 101”. Goal Progress: 40 quilts complete and 12 more to go to meet my goal of 52 quilting projects completed by Dec 31, 2011. This entry was posted in Completed Quilt Project and tagged Bear Paw Quilt, Purple Quilt, Queen Sized Quilt, Traditional Quilt, UFO, Wedding Quilt. Bookmark the permalink. Peggy, the bear claw looks wonderful!! Great choice of colours and a great salvage job!! And all for $2 (ha ha). Thanks for your encouraging comment. It was good to have your visit while the quilt was still on the frame. Funny how a $2 expenditure grows…I try to ignore what I spend on the sashing, borders, backing, thread and batting! In my mind, it is still my $2.00 bargain! LOL!